Yad Vashem recently recognized Lois Gunden, an American Mennonite who helped save Jewish children while in France during the Holocaust, as Righteous Among the Nations. Gunden will be posthumously honored in a ceremony that will take place in the United States, in which her niece, Mary Jean Gunden will accept the medal and certificate of honor on her behalf. Yad Vashem, the Holocaust Martyrs’ and Heroes’ Remembrance Authority, was established in 1953. Located in Jerusalem, it is dedicated to Holocaust remembrance, documentation, research and education. According to a Goshen (Ind.) College press release, Gunden Clemens was a 1936 Goshen College graduate and a French professor at the college from 1939-1941 and 1944-1958. 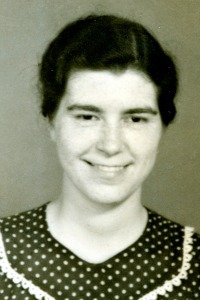 In 1941, twenty-six year old Lois Gunden, a French teacher from Goshen, Indiana, accepted the call to serve with the Mennonite Central Committee in southern France. Gunden joined the Mennonite organization Secours Mennonite aux Enfants in Lyon, and was sent to establish a children’s home in Canet Plage, located on the seaside of the Mediterranean. The children’s center became a safe haven for the children of Spanish refugees as well as for Jewish children, many of whom were smuggled out of the nearby internment camp of Rivesaltes. It was there that Lois Gunden approached Ginette’s mother and pleaded with her to let her take the child out of the camp. While hesitant at first, Gunden managed to convince her that Ginette would be safer under her care, and Ginette’s mother decided to part from her child. Far from her home, Gunden would show great courage, ingenuity and intuitiveness, as she rescued children of a different nationality, religion and background. One morning while the children were out for a walk, a policeman arrived at the center in order to arrest three of the Jewish children, Louis, Armand and Monique Landesmann. Gunden told the police that the children were out and would not return until noon. At noon the policeman appeared again and ordered her to pack the children’s belongings and prepare them for travel. This time Gunden told him that their clothing was still being laundered and would not be dry until the late afternoon. Gunden testified that throughout that day and evening she prayed for wisdom, guidance, and the safety of the three children. The officer never returned and the children were saved. During this time Gunden kept a diary, describing in it her experiences and daily activities. In November 1942, the Germans occupied southern France. Although Gunden was considered an enemy alien after the United States entered the war, she continued to run the children’s center. In January 1943, Gunden was detained by the Germans until she was finally released in 1944 in a prisoner exchange, later returning to her home in Indiana. In 1958 she married a widower, Ernest Clemens. While she did not have any children of her own, Gunden gained a stepdaughter through her marriage. In addition to teaching French at Goshen College and Temple University, she also ministered in the Mennonite Church. Gunden passed away in 2005. On Feb. 27 Yad Vashem recognized Lois Gunden as Righteous Among the Nations. Lois Gunden is one of four Americans to be recognized by Yad Vashem as Righteous Among the Nations alongside Varian Fry and Waitstill and Martha Sharp.